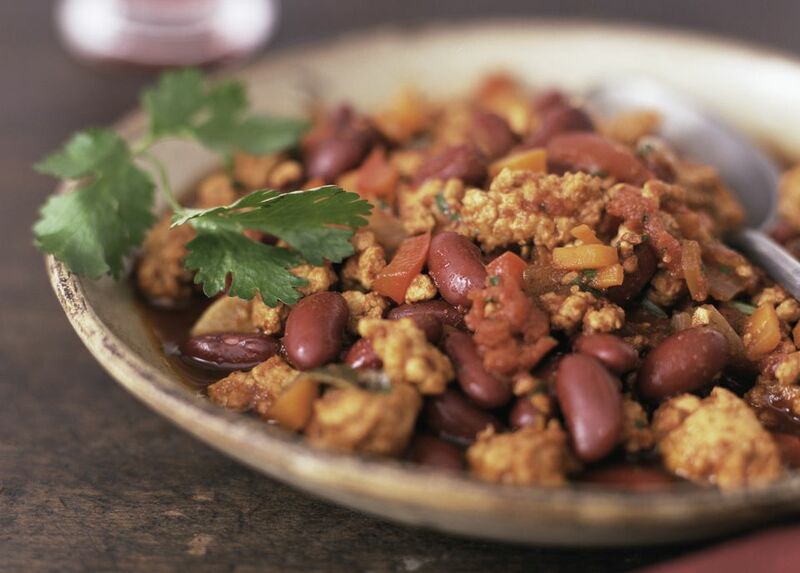 Homemade vegetarian chili with both tempeh and beans means this chili recipe packs a powerful protein boost and has a satisfying texture. Since the tempeh simmers so long in this recipe, there's no need to pre-simmer it, as with most tempeh recipes. Note that because this recipe calls for soy sauce it is not gluten-free. Further, some types of tempeh are made from grains which include gluten, while other varieties are gluten-free. Swap out the soy sauce and make sure your tempeh is gluten-free if you're preparing this chili for anyone with a wheat or gluten sensitivity. Using one tablespoon of olive oil, saute the tempeh until it is lightly golden brown, about 3 to 5 minutes, then add in the add soy sauce, and saute for another minute or two, until the soy sauce is sticky and dissolved. Set aside. In a large soup or stock pot, saute the onions, garlic and bell peppers in the remaining olive oil until just barely soft. Reduce heat and add remaining ingredients, except cilantro and including the tempeh. Allow to simmer for at least twenty minutes and up to forty minutes, stirring occasionally, and adding a bit more liquid as needed. Garnish with a sprinkling of fresh minced cilantro. Makes 6 servings tempeh chili.